I don’t know much about York Imperials, but I do know that Cox’s Orange Pippin is one of the best eating apples in the world. It has a vivd sweetness that is relieved by a pleasant sourness that with the crunch and ooze of the first bite, brightens up your palate. Eating fresh apples is such a pleasure. I have eight different varieties growing in my orchard and I love moving from one tree to the next at this time of year munching and comparing sweetness and colour and texture and flavour of the Cox’s with the Snow Apple and the Jonathan and the Red Delicious. It’s not an expansive collection, but it is full of the varieties I love. Adam picks, with the help of Elaine, every single apple from the tree. There are eight apple trees in our orchard, which means a lot of apples. More than we can eat. More than we can preserve, store and eat. 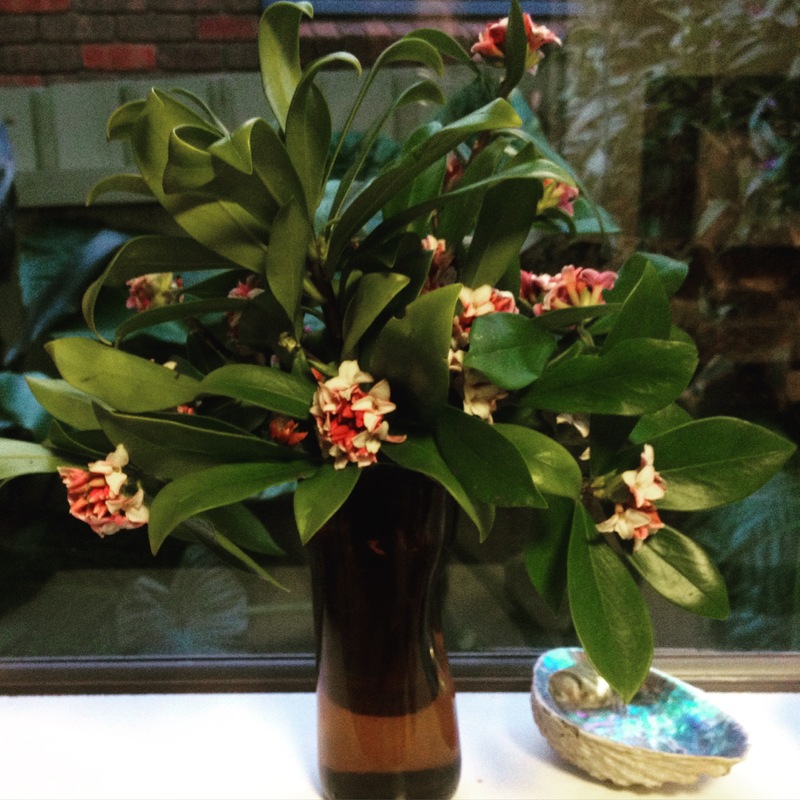 As the trees have slowly matured over the years, I have been noticing the increasing harvest sizes and have been wondering what to do with them. Giving them to a food charity is one option (and I plan to give some of the bounty to Open Table https://www.facebook.com/opntbl/info?tab=page_info). Cider is the other option. 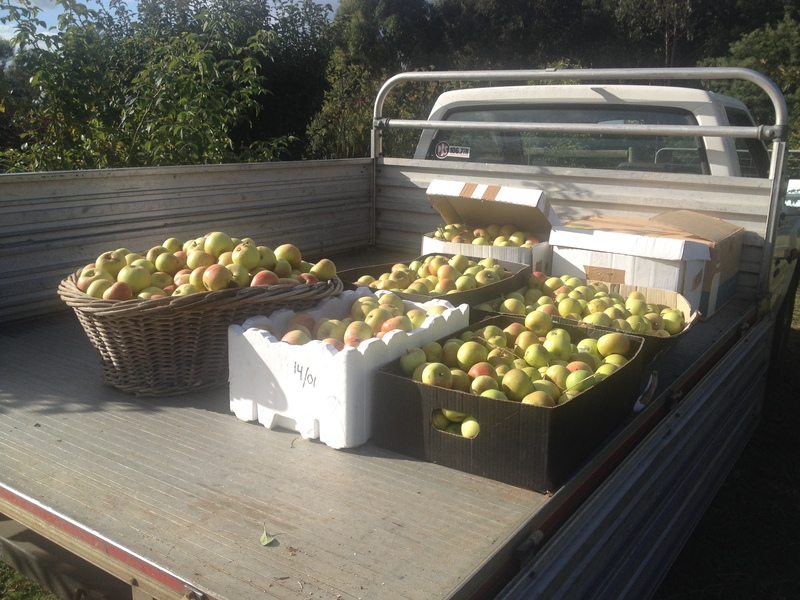 The back of the old ute with our crop of Cox’s ready to head to Margaret and Peter’s. My friends Peter and Margaret are excellent home gardeners and they too have some lovely apple trees such as ‘Lord Lambourne’ and we have been talking for a while about turning these luscious fruits into something a little bit more alcoholic than apple pie and apple strudel. This year, after discovering the most wonderful shop in Melbourne, if not the world, Costante Imports in Bell Street Preston, where we purchased the appropriate equipment (<http://www.costanteimports.com.au&gt; No, don’t check them out yet, we’ll never see you again), we decided that the only thing holding us back was inaction. So we acted. The following photos tell the story of how we picked, cut up, scratted (i.e. 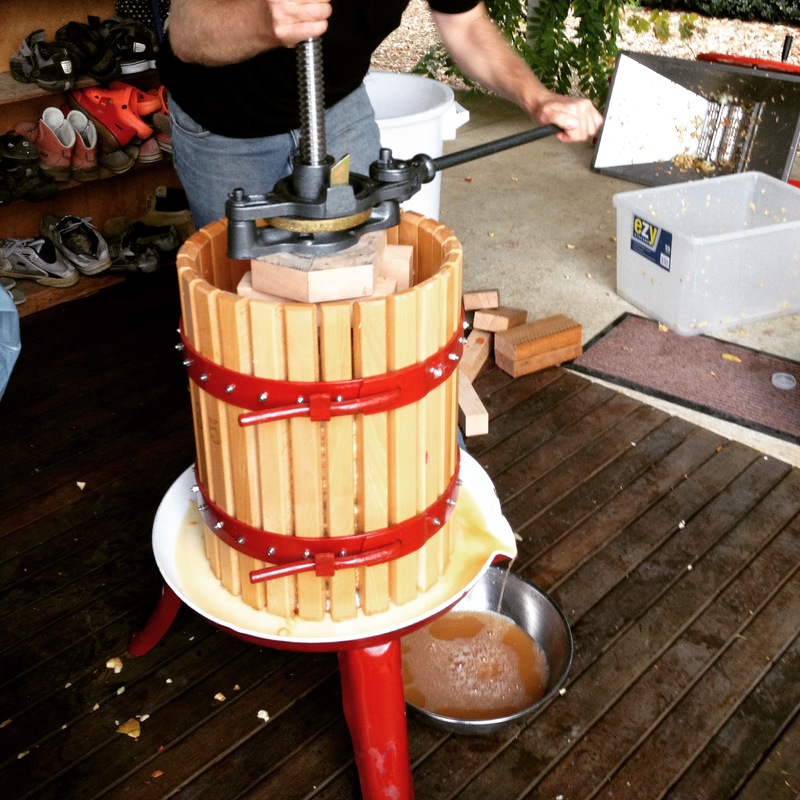 crushed) and pressed all the apples from my Cox’s Orange Pippin and how eight hours later we put the caps on two carboys that contained all up 62 litres of apple juice ready to be fermented into cider. There are a few scientific sort of things we had to do after that. I will let you find out that stuff online, as we did, because I am sure that others can explain the process far better than I can. 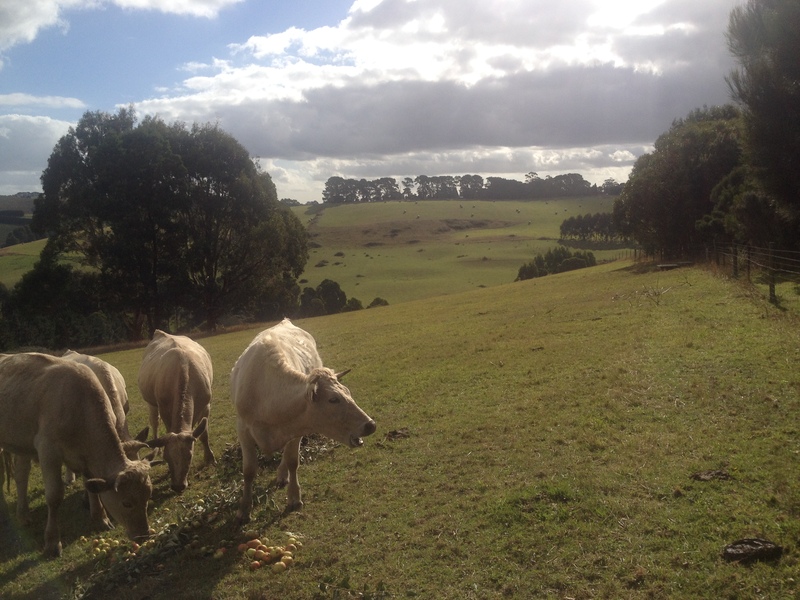 The cows were very happy to feast on the apples that were too damaged to press. The cutting of the apples. 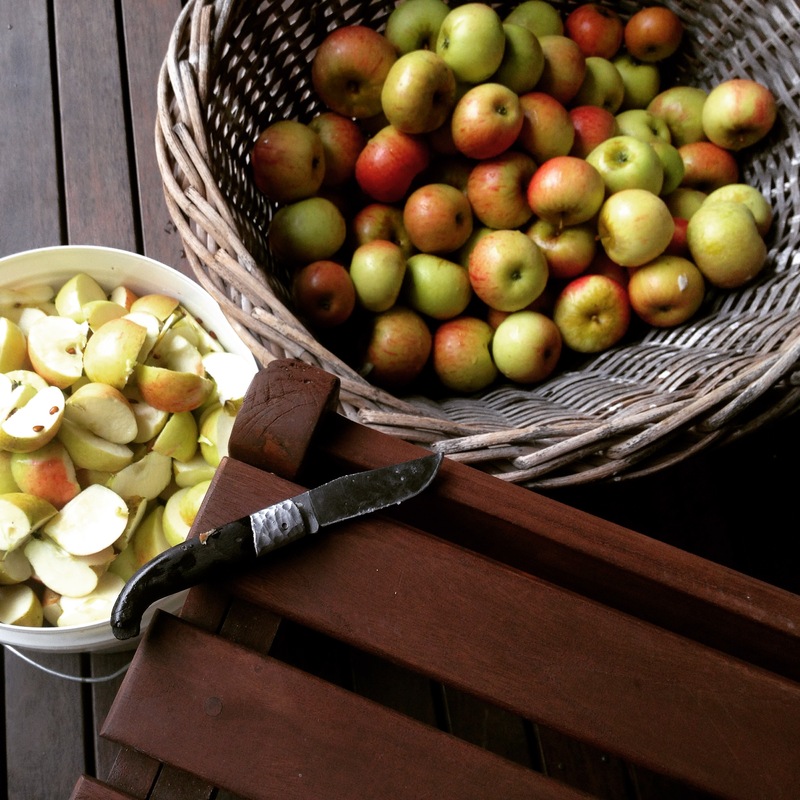 The scratting of the apples. 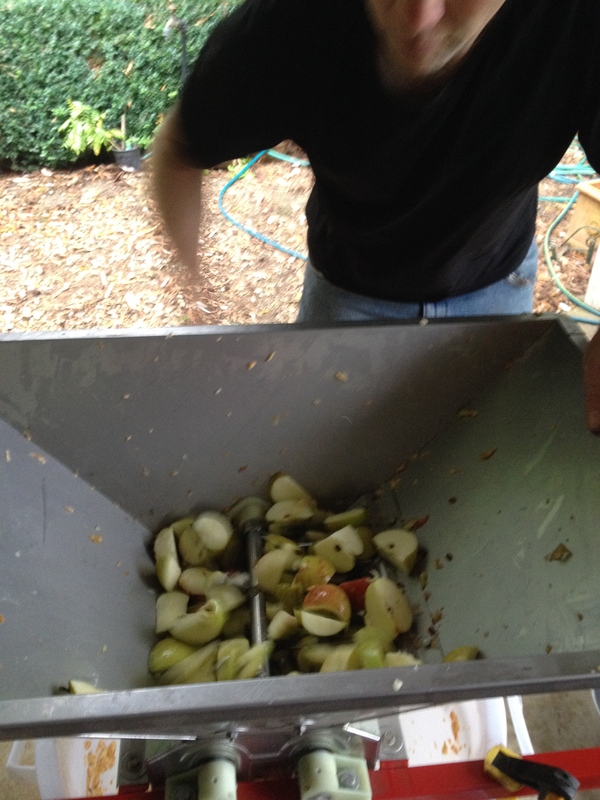 The pressing of the apples. See the lovely juice flowing into the bowl. It took a lot of elbow grease. Margaret proved to be the best presser of the three of us, I will concede. 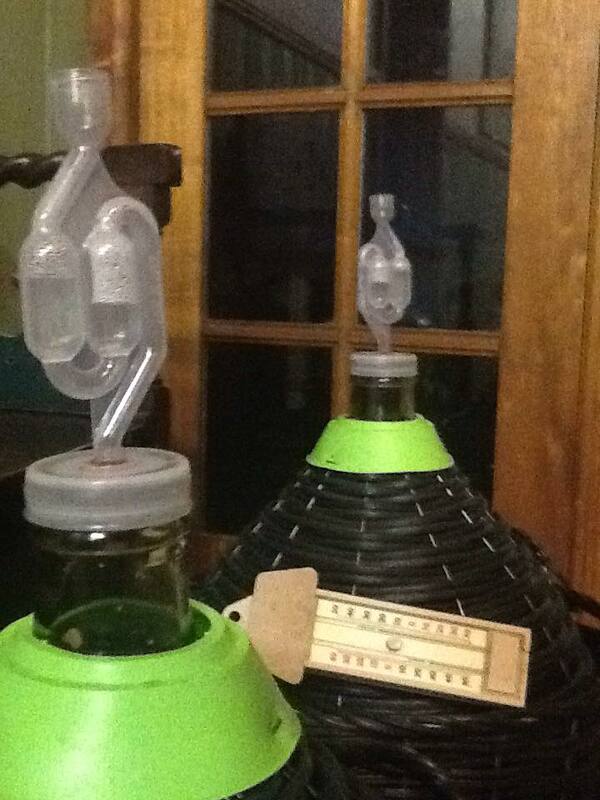 This is Peter’s photo of the carboys that contain the juice, which now, thanks to the addition of some brewer’s yeast, is busily fermenting. So that’s one tree taken care of. I have good crops on at least five of the remaining apple trees. I am not sure if we will make another batch of cider this year, but I will definitely be storing a good selection of the rest of the apples in boxes in cupboards and sheds, to keep me going for the next five or six months (they keep really well in cool dark places in shallow boxes). 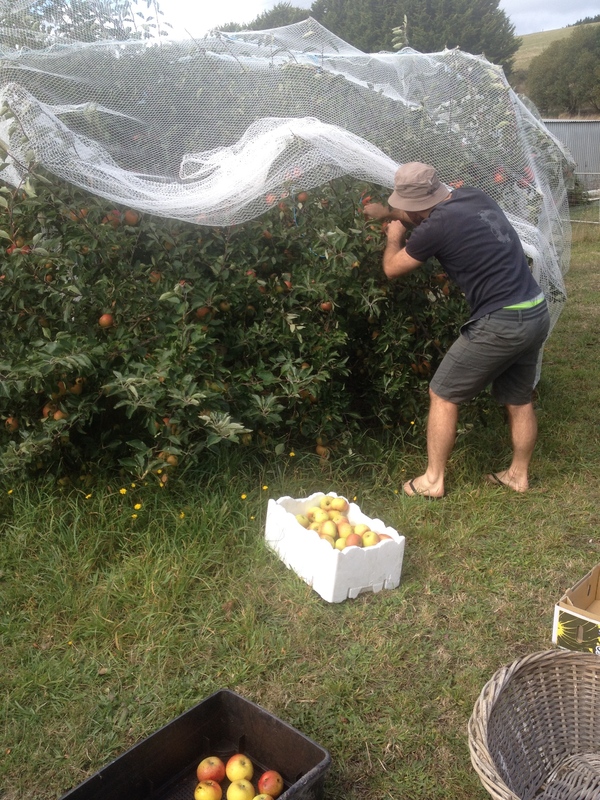 So the York Imperials might delight the cider makers of Virginia, but in South Gippsland, Cox’s Orange Pippins are our first choice for cider making. For now at least. We will be planting some actual cider apples this year. But that’s another story. Until then, enjoy your apples and enjoy this poem by a Melbourne born poet who knew that apples, like all of us, can improve with age. Gardening in South Gippsland is a pretty easy business compared with much of this arid continent. 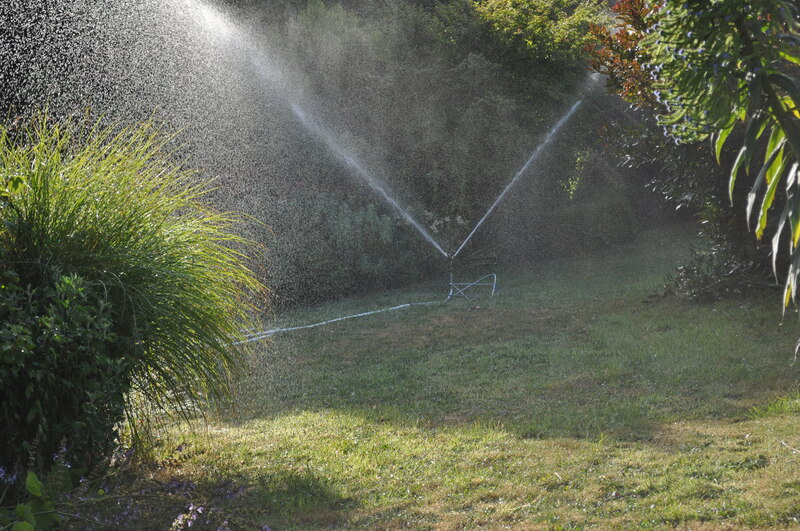 We have reliable rains regularly throughout the year and really only have to water consistently from mid summer through to early Autumn and even then we can be lucky and have the occasional downpour that perks everything up. Like we have had in the past few days. Nevertheless, when you are gardening on the top of a hill and you have free draining volcanic soil as your growing medium AND when you are prone to high thirty degree celsius temperatures (or worse) for days on end, supplementary watering is necessary especially for vegetables and some perennials and of course if you want the grass to stay green. I am fortunate, in that I can pump water up from a dam and give everything a good soaking a couple of times a week (in the evening so that it has a chance to soak in). Then I top up the vegetables with hand watering from a tank, in between times. Also, I take steps to make sure that the water stays put for as long as possible. I mulch and enrich the soil with moisture absorbing humus in the form of compost and manure. I have also planted low hedges around the vegetable garden and trees out in the paddocks to help to minimise the wind. How do you keep your garden growing over the dry spells? When I arrived at ‘Clear Springs’ in classic spring drizzle, the colours of the seasonal blossom and flower glowed brightly in the mute light, against the grey sky. It was Thursday and ahead of me lay four days in the garden, before I had to go back to the city and to work. And in front of me, on a grassy path, lay Mme Alfred Carriere. She lay sadly beside the verandah post she was supposed to be attached to. She looked like a badly broken limb: at the wrong angle and disconcerting. An instant sense of guilt came. I had meant to prune all the roses on my previous visit, but had only managed to trim a few of the bush roses, daunted no doubt by the mammoth task of thinking out and tidying up the vigorous old lady of the climbing rose world. My failure to act meant that she was too top heavy and the wires that supported her buckled in the heavy winds. My initial dread subsided somewhat when I discovered that she had slumped rather than snapped. I figured I could reattach her. Once righted, she stood proudly again and I picked a few of the exquisite buds that were beginning to open and enjoyed the rosy fragrance from the cream flowers, so palely stained with pink, the margin of the outer petals a wrinkled, cerise edge. These colours usually bleach away in the bright sun, but this grey day had kept the precious colours vivid.